The Rio Masquerade Show in the Sky is now Closed. The Rio’s floating parade is closed after 16 years. We are truly sad to see this go. We take all Vegas new comers to see this and the Buffet. You haven’t been to Vegas unless you have seen this parade. Vegas never holds on to anything, it is always looking forward. We will miss getting our beads from the scantily clad dancers from above. We can still hear the music, see the stage performance and the floats overhead. The show started in 1997 as part of the Masquerade Village expansion. We really loved this expansion and it won the Best Hotel – Cabbie award – Cab Drivers are never wrong, except when they take you through the tunnel. It is really a must see show, along with the casino. 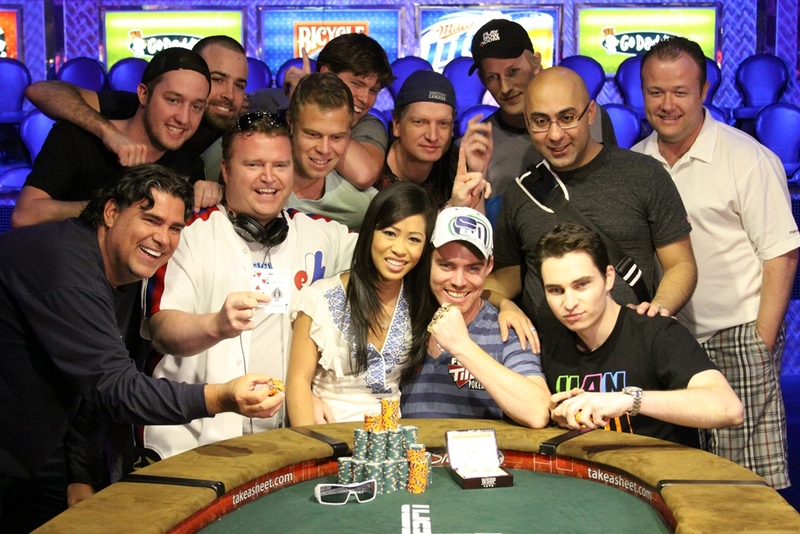 For the three American players left at the World Series of Poker, it’s all about the big payday and living the dream. Phil Collins (no relation), Matt Giannetti, and Ben Lamb (who made $2 million over six weeks at the Rio) are all former college students with youth on their side that play quite aggressively, and are ready to take on the biggest moments in their poker careers after dominating the online poker scene. At noon Saturday at the Penn and Teller Theater at the Rio, they’ll get their shot. If one of them wins, it would be the first time since 1998 that the champion’s gold bracelet stayed in Las Vegas. We wish them the best! 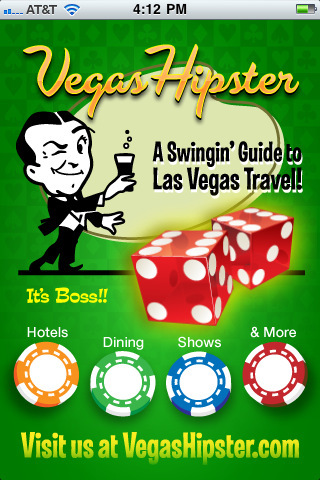 For more of all things Las Vegas, get the Vegas iPhone App. Don’t forget to head to Vegas on a Budget, What to Wear in Vegas, Stories from Vegas, Where to Eat in Vegas, Vegas Hipster, find us on Facebook and follow us on Twitter! Ever wanted to just fly away? We have too, and Vegas Indoor Skydiving gives everyone who meets the requirements just the opportunity they’ve been looking for. Vegas Indoor Skydiving has been open since 1982 and provides the opportunity of a lifetime to those interested in flight. You may have seen celebrities such as Travis Pastrana and Britney Spears give it a whirl; now you can, too. From instruction to flight, the whole process takes an hour for a first-timer and costs $75, then only $40 for a repeat flight the same day. You’ll also want to check out your DVD ($25) for laughs afterwards. Want to know more? 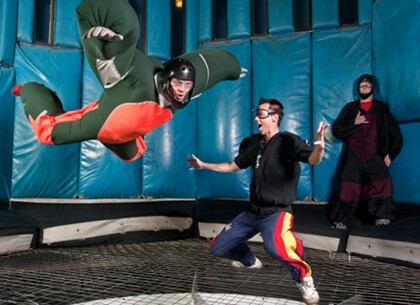 Check out Vegas Indoor Skydiving’s site. Also, we have a money-saving hotel deal at the Rio to help get you in the air for less. The Vegas iPhone App is FREE for a limited time only! Track the hundreds of attractions, such as (Vegas Indoor Skydiving) we have in our database, complete with price ratings, photos, reviews, and contact information for all the best in Vegas. Enjoy, and be sure to check out Vegas Hipster, find us on Facebook and follow us on Twitter! Vegas iPhone App Now Available! It’s here! Your number one source for Vegas information finally has the app to keep you going no matter where you are in Vegas. Get it here! The Vegas iPhone app is designed to give you the latest and greatest information and media on Las Vegas, and even has some special features you won’t find in other apps. Everything is at your fingertips—Gaming, Restaurants, Hotels, Attractions, Entertainment, and even a GPS Tracker we call the Friend Finder. This is your one stop shop for all things Vegas, and the only app to have, whether you’re planning a trip or already there. -Available for iPhone, iPad, and iPod touch. -Hundreds of options to choose from for Hotels, Dining, Shows, Clubs, Attractions, Sports, and more, complete with pricing, reviews, photos, and categories for each option. -Full contact information for all venues. Read the reviews, call the restaurant, make a reservation, and you’re out the door. -Once you’re out, connect with your friends via the Friend Finder portion of the Vegas Hipster app. See where your friends are at, create, join, and leave groups, and make it easy to meet up in the busy Vegas atmosphere. Get the Vegas iPhone app here! Even in an uncertain economy, Las Vegas continues to grow. In the month of June, statewide gambling revenue jumped 16 percent. This was the second straight month of increases of 10 percent or more, and the largest since February 2010. 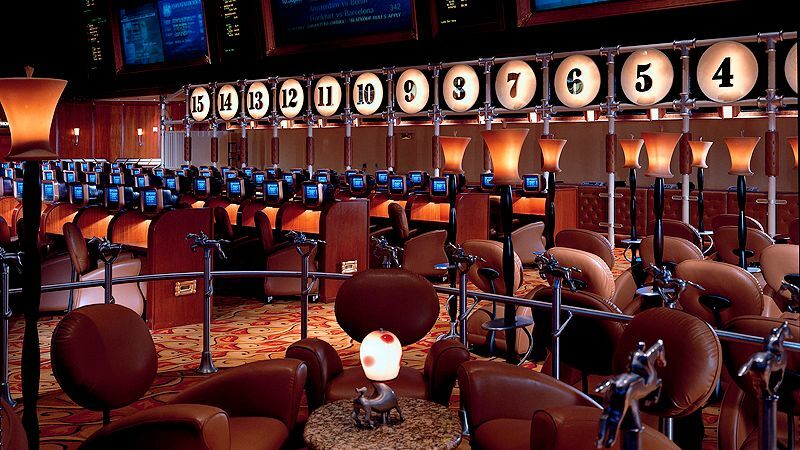 Most of the revenue came from high-spending baccarat players, so it sounds like more people need to head to our gambling section and check out How to Play Baccarat. 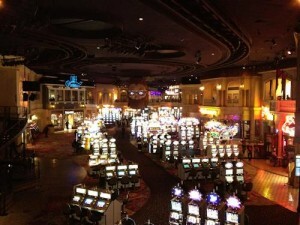 Slot machines and table games also saw a significant increase, pointing to a recovery of the Vegas area as a whole. We’re happy to see that Vegas is doing well, and if you want to head out there and get going with the gambling, we have a deal for you at the Bellagio . 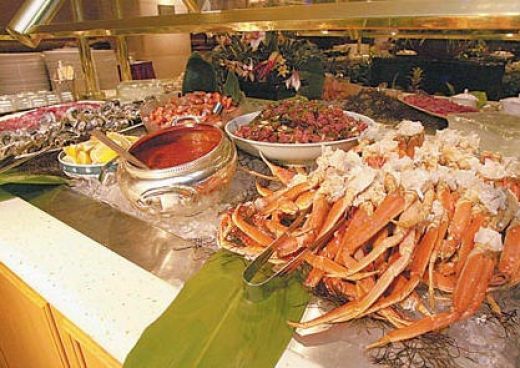 If you are a seafood fanatic and in Las Vegas, one of the must-see (and must-eat) destinations is the Rio’s Village Seafood Buffet. There are other things on the menu, but if you aren’t into seafood, it’s really best to dine elsewhere. For the seafood lover, however, this is paradise. There is a reason that there are long, albeit quickly moving, lines here. Lobster is only served at dinner, but other than that, everything’s fair game all the time. 13,000 square feet of sushi, snow crab legs, shrimp, fresh oysters, and much more? We’ll take it. Bring your wallet (you’ll be looking at about $25-$40) and appetite, and we’ll meet you there! Need coupons for the Rio? We’ve got you covered for as low as $49 a night . That way, you can fill up on food, not the room. Want to eat at the buffet? Check out the Rio’s web site here. The best Vegas buffet deal in town has to be the “Buffet of “Buffets” For only $44.99 you can eat at 7 of the Vegas best buffets in town at any time within a 24 hour period. We have done the countless times. Imagine eating anytime you want, any buffet you want, as many times as you want in 24 hours. Here is how we do it to get the most bang for our buck. 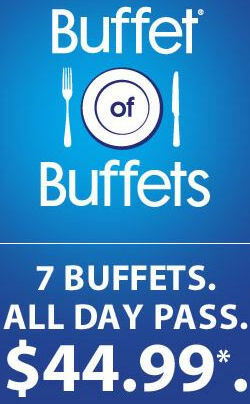 Buy your buffet pass at dinner, that way you can eat two dinners. Dinner is the most expensive buffet. Some times the price can vary by $10 between Breakfast and dinner. Your meal plan would look like this: Dinner (night 1), Breakfast, Lunch, Dinner (night 2). Our personal favorite if the Rio Buffet Carnival World Buffet. 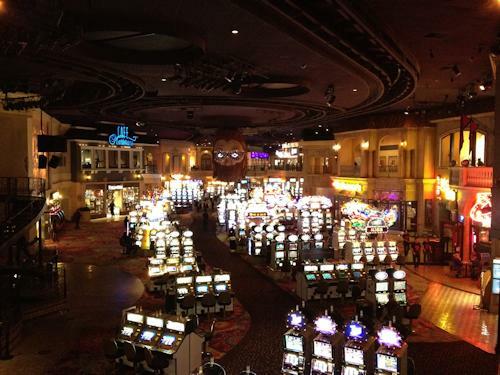 The Rio’s Buffet is just so big, it has something for everyone. We completely agree that the food sometimes lacks, but you can always get something else. If you want something upscale try the Le Village Buffet at Paris Las Vegas. If you want food that is prepared really well, go to the Spice Market Buffet. If you want Sea Food and we mean a lot of it, piles and piles of Lobster Tail spend the extra $15 and go the the Village Seafood Buffet at the Rio. Don’t forget you can stop by a buffet just to grab a quick bite between meals. This pas is good for as many visits you like during business hours. Make sure you are a Total Rewards member. If not, stop at any Caesars Las Vegas Properties, including, Harrah’s. Flamingo, Planet Hollywood, Paris Las Vegas, Imperial Palace, Rio Las Vegas and of course Caesars Palace. The price does go up if you are not a Total Rewards Member. Please see click HERE for Frequently Asked Questions (FAQ) for details. The Rio Secco Golf Club in Las Vegas has something pretty interesting going on and they are called T-Mates. T-Mates are Las Vegas’ only genuine female caddies. This is probably something you won’t tell your girlfriend about. I wonder if Rodney Dangerfield would have ordered some of these from the pro-shop in “Caddy Shack”. “Give me two of those, a box of those, a set of naked lady tees and a free bowl of soup”. On July 25th 8 people were arrested for either solicitation of prostitution and/or Posession of narcotics/paraphernailia. Two of the women, Phoenix Kuzara (soliciting prostitution) and Brooke Firks (obstructing a public officer), will not be charged due to insufficient evidence. No Charges have been filed against the Rio or Sapphire Gentlemen’s club. The Nevada Gaming Control Board was unable to comment. Microsoft Surface computers are now at the Rio iBar. Harrah’s is the first company to deploy a Microsoft Surface Computer with a suite of customized applications. Of course the units will be branded with Harrah’s / Rio branding, but the applications on the computer are quite intriguing. Microsoft Surface is a 30-inch table display that individuals or multiple people can interact with digital content, using touch and gestures or using objects from the real world, like a glass, yes you can put your drink on it. I have seen it used in a scenario of laying our cell phones and it will tell you which phones they are and what capabilities they have. Yes we go to CES and other geek outings. This table paired with electronic devices such as bluetooth, RFID, GPS will be really cool in the future. The Rio’s iBar is located at the main entrance of the Rio. Literally as soon as you walk in the front doors 25 feet in-front of you is the ibar. Each table is estimated to cost $10,000. Microsoft has created applications for the Rio All-Suite Hotel & Casino iBar that include games a group can play together. • Flirt Vegas style by adding a hip ultra-lounge vibe to the flirting experience. This application allows guests to create an exciting new way to chat and meet people from one Surface to another. Strategically placed video cameras at each Surface add even more energy to the action, allowing guests to interact with old friends, flirt with new acquaintances, and take and send photos across the lounge. • Mixologists are inspired to create and order their own signature cocktails for themselves or to send to that special someone across the room using Surface and Harrah’s intuitive food and beverage application. • Hip-notic describes how guests will feel when kicking back to find and view the latest and most popular online videos with their friends on Surface. • Head Games are taken to a whole new level with Harrah’s creative suite of play-for-fun games. 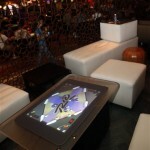 With the unique Surface interface, Harrah’s adds an exciting new take on some old favorites such as High Roller bowling, Dissed multiplayer pickup pinball, and a Last Call musical memory game that encourage the whole group to play together. Leaderboards add excitement as guests compete with one another to see who can climb to the top of the scoreboard. 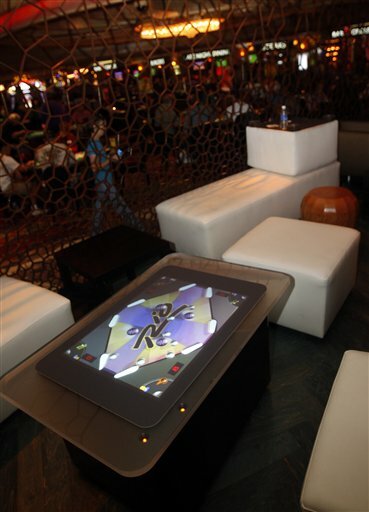 In addition to Harrah’s unique applications and play-for-fun games, the Surface units also feature a photos application and a virtual concierge application developed by Microsoft that Harrah’s customized for its environment. • See and Be Scene is what guests can do as they tour all of Harrah’s Vegas properties and explore attractions in Vegas without leaving their seat at the iBar. • Virtual Vegas aptly describes how guests will take a virtual walk down the Las Vegas strip on Surface, letting their fingers be the guide. Guests will be able to get information on the latest events and attractions at all Harrah’s properties throughout Vegas.